Experience something different, special and fulfilling on your next vacation! 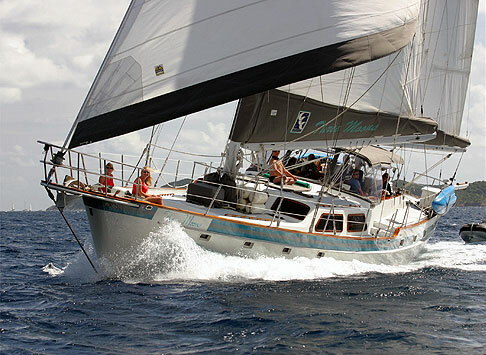 We invite you to explore and experience the steady sailing waters of the U.S. Virgin Islands and British Virgin Islands. To see new things, and old things, in a new way. To stand at the rail of the yacht Three Moons and greet each new island; to try something everyday that surprises you; to find the time to do absolutely nothing. We invite you to find inspiration and beauty, along with the unexpected, at every turn. Turn up the HEAT. Make your ESCAPE. Step on board the yacht Three Moons and learn about Caribbean yacht charters on a private professionally crewed yacht. Classic yacht beauty and traditional touches with modern conveniences add to your pleasure while sailing and sunbathing on Three Moons wide spacious decks. The yacht and her hospitable crew of three were designed especially for Caribbean chartering with four equal air conditioned cabins. Watersports galore! That's a requirement for any sailing vacation! We offer a lightening fast 17' Caribe dinghy with 115HP Yamaha engine that will take care of all your waterskiing, wake-boarding, knee-boarding, tubing, aqua-nauting, and exploring needs. You'll enjoy snorkeling with quality equipment as well as rendezvous diving upon request. And don’t forget the two 2-man kayaks for total freedom from it all! Comfort, relaxation and fabulous Award-winning Cuisine are yours sailing our handsome 72 foot yacht throughout an exquisitely inviting playground...St. Thomas, St. John, Norman Island, Jost Van Dyke, Peter Island, Virgin Gorda are but just a few of the islands we sail. Pamper yourself as Three Moons is the only yacht based in the USVI that offers a "Sea Spa" on board with manicures, pedicures, facials and mini-massage.